The K'NEX Multi-track gear Green shown in the photo is a crown gear similar to the large yellow crown gear, but in addition it has a second ring of teeth. There are 82 teeth on the outer ring, and 64 teeth on the inner ring. This allows the multi-track gear to drive two gear wheels separately, at different speeds, as shown in the photo. 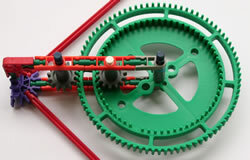 The K'NEX Simple Machines deluxe set uses the gear multi-track green to create an ingenious clock model, as shown in the photo.